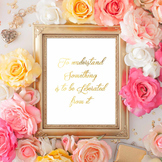 I use this poem as a simple and fun end of the year gift for my students. 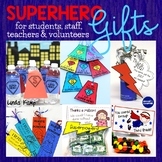 Just simply place the items listed in a bag and distribute to children on the last day of school. 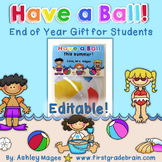 Easy Beginning of the Year OR End of Year Gift for Students - 4 Dice Games! For the end of the year, I print these notes on bright paper and tape them to crazy straws along with a packet of Kool-Aide. It is so fun and easy!! 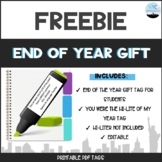 At the end of the year, we give our students something they can use and remember us by. We present each student with a high-liter with an attached tag. Their are 16 tags per page. The tags have been uploaded in an editable version of Microsoft Word. Make sure you change the name before printing. 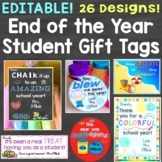 These labels can be paired with a set of bubbles to give students as an end of the year gift. I printed them and used a sticker machine to attach them around the outside of bubble containers from the dollar store. However, they can also be attached by ribbon! 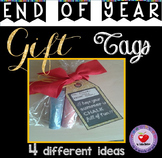 Attach these bubble tags to bubbles for cute and easy gifts for end of the year for your students! 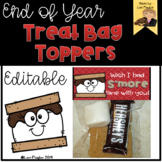 End of Year gift- Wish I had S'more Time With You! End of Year Gift: Owl miss you! 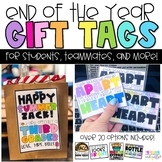 Use these adorable owl themed tags for your end of year student goody bags. 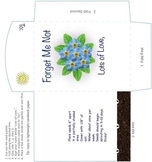 Each tag says "Owl miss you! Have a hoot this summer!" I found this cute phrase on Pinterest and decided to make tags for my students. I attached mine to cookies, but you could attach it to candy or other goody bags. 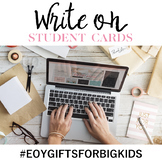 What could be better than a new pencil and an opportunity to be pen pals with your teacher?! Simply print this letter and write your name and address at the bottom. 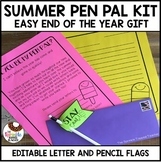 Attach a special pencil or pen and you have an instant and special end of the year gift for your students.